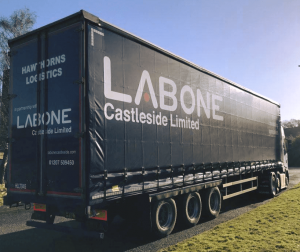 It is with great pride that this week saw the culmination of a 6 months long project to overhaul the internal logistics operation with the delivery of the newly branded Labone Castleside liveried trailers. As part of the continuous improvement programme, the management team have investigated the internal process of key areas of the business to see what improvements and efficiencies could be made, one of which was logistics which is a significant overhead to the business. The Labone Castleside team engaged with 3 local businesses, one of which was the incumbent. Throughout a very thorough process, due diligence was carried out over several months and the logistics contract was eventually awarded to Hawthorns Logistics Ltd.
As part of the new contract, it was agreed to supply new liveried trailers to use on the delivery runs to their customers. We are extremely pleased to say the first of which arrived this week as the pictures show. There are further 5 trailers to be delivered in the coming weeks.